Sixteen apprentices from global engineering company Renishaw attended the UK's largest manufacturing trade show recently to motivate young people to consider a career in engineering. 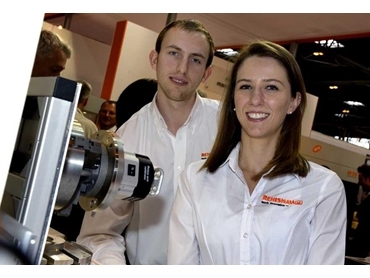 The Renishaw apprentices were supporting the efforts of the organisers of MACH 2012, to ‘inspire, prepare and motivate the next generation of British engineers', by taking students in the age group of 14-16 years on tours of stands with the latest high-tech engineering products. The initiative by the Manufacturing Technologies Association and the Design Technology Education Partnership included an Engineering & Training Zone, which contained star attractions such as the BLOODHOUND Supersonic Car and the Advanced Manufacturing Research Centre's unique travelling MANTRA vehicle, which gave people a hands-on experience with cutting edge engineering technologies. Renishaw is committed to the development of young engineers through apprenticeships, undergraduate placements, graduate training schemes and its own Applications Academy. The 16 engineers included Tom Silvey, a 3rd year apprentice, who earlier this month was named Gloucestershire's Apprentice of the Year, and Roxanne Pollard, a 2nd year apprentice, who last year represented the UK at the International Science & Engineering Fair competition in Los Angeles. According to Peter Bowler, Renishaw's Group Human Resources Manager, the initiative, which aimed to plug the increasing skills shortage within the engineering sector provided a great opportunity to inspire young people by exposing them to the latest high technology from sophisticated computer aided design software and metal cutting machine tools to the latest high speed products that measure parts to millionths of a metre accuracy. Renishaw is currently recruiting 29 apprentices within the UK in technical, manufacturing and software segments in addition to providing employment to 30 new graduates and placements to 80 undergraduates this summer.